The Starboard Sweater will be 20% off until March 8 at noon, PST. Enjoy! The starboard sweater is knit seamlessly, worked back and forth using an intarsia method of switching direction that allows for a seamless “in the round” look. 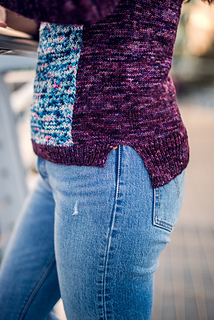 The texture worked along the front of the sweater is an easy to memorize two row repeat! Don’t forget to check out the amazing yarn from Old Rusted Chair.